So you can calm down -- or stock up on repellant. 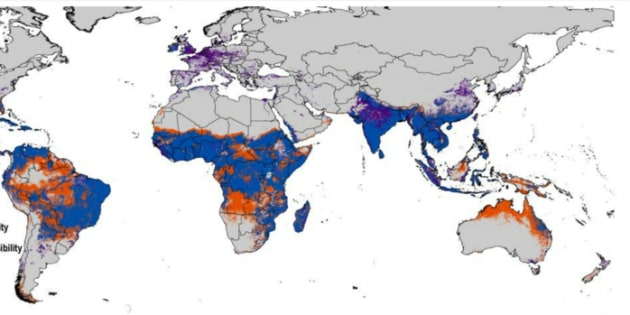 This map estimates the risk of local Zika virus spread around the world. Now that Zika virus is spreading locally in Florida, U.S. residents, and especially pregnant women, are growing alarmed at the risk that they may face in their own communities. A new map estimating the risk of local Zika spread around the globe shows a relatively small likelihood that most of North America and Northern Asia will be affected. By contrast, all the variables are in place for local spread in most of Africa, South and Southeast Asia. 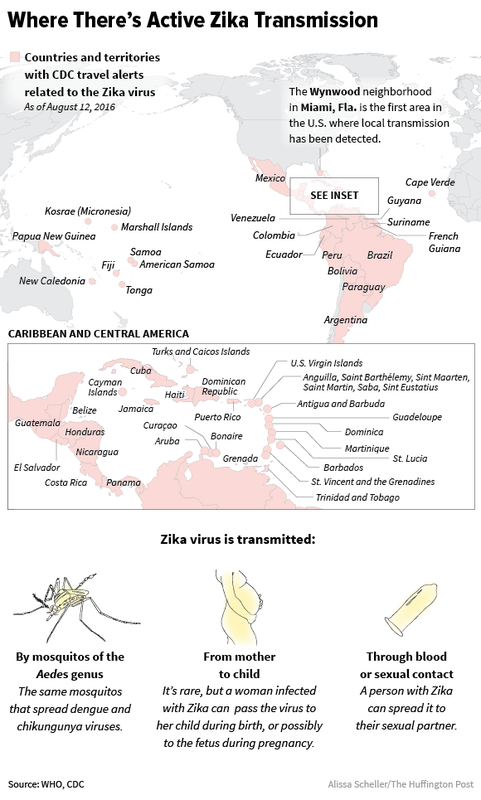 Already, Zika virus is spreading locally in 54 countries and territories, mostly in Latin America, the Caribbean, and the Pacific Islands. Researchers at the University of Kansas hope their map can help drive preparedness efforts and create calm among those who are at low risk. They submitted their work to the Brazilian journal Memórias do Instituto Oswaldo Cruz, where it was made public in April because Zika virus is a public health emergency of international concern. However, the map and accompanying research just finished undergoing peer review last week. While this isn’t the only time scientists have tried to map the global risk of local Zika virus spread, Samy’s map takes into account human behavior like travel from countries affected by Zika, as well as socioeconomic factors, in addition to climate and the presence of mosquitos. Samy and his colleagues evaluated several factors for each five by five square kilometer of space on the earth to calculate the risk of local Zika spread, including mosquito abundance, climate, socioeconomic status, land cover and accessibility (the chances of someone traveling from an area that already has local Zika spread). They then corroborated their local Zika spread model against real-time local spread in Latin America before applying it to other parts of the globe. In the map above, areas in orange show that mosquito presence and environmental conditions would drive local spread. In purple areas, human conditions and travel accessibility would spread the disease. The blue areas are places where all measured factors would work together to drive local Zika spread. While most of the U.S. doesn’t have the factors that could drive local spread, the map shows that Florida, Texas and Louisiana are most at risk. Florida has already confirmed 28 locally transmitted Zika cases, and Texas health officials have been carrying out a public health campaign on how to protect against bites and preparing for the possibility of small local outbreaks. Anthony Cornel, a medical entomologist at the University of California, Davis, wasn’t involved in the creation of the map, but praised its makers for including the parameters they did. But he did point out that several other important variables may affect outbreak risk and weren’t included. For example, the University of Kansas analysis does not take into account the possibility that different countries, specifically in Africa and Asia, may have already been exposed to less virulent Zika strains, making them less vulnerable to a massive outbreak. Samy conceded that while he didn’t take population immunity into account, it’s less likely that countries like the U.S. will have any immune defenses against Zika virus, because the disease has never been present there until now. The map also doesn’t distinguish between the Aedes aegypti mosquito, which is the most efficient Zika spreader, and the Aedes albopictus mosquito, which also carries the disease but is not believed to spread it as easily. Another Zika risk map published in March by researchers at the University of Arizona, the National Center for Atmospheric Research and other institutions focuses just on the United States. It evaluated factors like past outbreaks of the mosquito-borne viruses Chikungunya and dengue fever, the presence of the Aedes aegypti mosquito and travel patterns of people returning from endemic Zika countries. The researchers predicted that the southernmost tips of Florida and Texas were most at risk of a small Zika virus outbreak, while southern cities like New Orleans, Mobile, Charleston and Savannah may also have heightened risk of local spread. So far, their prediction that Miami would experience a small local outbreak has turned out to be correct. Researchers from the University of Arizona, the National Center for Atmospheric Research and other institutions depict the relative risk of Zika virus spread via the Aedes Aegypti mosquito in this map. Meanwhile, the only areas we know for sure can harbor local spread of Zika virus are those countries and territories currently experiencing an outbreak. According to the U.S. Centers for Disease Control and Prevention, this includes 54 countries and territories, as well as a small neighborhood in Miami.